Ochsner has embarked on an ambitious project to transform the health and wellness of our community, using schools as the focal point of our interactions. Research has proven that many chronic health problems, such as diabetes, obesity and hypertension, are primarily caused by lifestyle choices. In order to reduce chronic disease in our community, we need to change the choices and behaviors of our children and their families through exercise, nutrition and promotion of preventative health behaviors. Change the Kids, Change the Future™ is an overarching philosophy guiding Ochsner’s work in this area. By working to alleviate the cause instead of the symptoms, we can affect meaningful, lasting change the health and wellness of our community. Louisiana ranks at the bottom among other states in the nation in all health indicators: diabetes, hypertension, obesity. Adults in Louisiana 5th highest in the country, with 35% of its population identified as being obese, up from 22.6 percent in 2000 and from 12.3 percent in 1990. Disease caused by diabetes, hypertension and obesity is widespread and will only continue to get worse if the next generation does not intervene. In 2009, obese adults paid on average $3,236 more than their normal counterparts in medical bills. Childhood obesity is estimated to cost $14.1 billion annually in direct healthcare expenditures. At 34%, Louisiana has the 8th highest rate of overweight and obese youth, ages 10-17. The percentage of children aged 6–11 years in the United States who were obese increased from 7% in 1980 to nearly 18% in 2012. Similarly, the percentage of adolescents aged 12–19 years who were obese increased from 5% to 21% over the same period. Data from 2015-2016 (NCHS) show that nearly 1 in 5 school age children and young people (6 to 19 years) in the United States has obesity. Change the Kids, Change the Future™ is a fully integrated approach in the schools that encompasses education and lifestyle changes for students, staff and families to improve the health of the next generation. The program focuses on nutrition, exercise and healthy eating habits, all of which set the stage for children's ongoing behavior. Using our expertise in research and academics, we can also track the initiative's outcomes. We also have a public policy impact through advocacy efforts. Ochsner has partnered with Jefferson Parish Public Schools to improve the health and wellness of students, teacher and staff. As a pilot for Ochsner's Change the Kids, Change the Future™ campaign, this program is the first of its kind for the hospital. Ochsner and Jefferson Parish Public Schools have created on-site clinics for students, teachers, and staff at Bonnabel High School in Kenner and John Ehret High School in Marrero. Ochsner staffs a nurse practitioner five days a week and a pediatrician four hours a week. The clinics also provide their patients with full-time social workers. As fully-- functioning medical offices, the clinics are able to see patients who walk in or schedule an appointment for a variety of medical and psychological needs. Ochsner’s CHOP (Cooking up Healthy Options and Portions) is a cooking program that was designed to teach middle school students to prepare healthy meals, and feel more confident in the kitchen. Our goal is to reduce childhood obesity through a school-based program by providing students with pertinent nutrition information, physical activity and the skills necessary to successfully navigate a kitchen. Through this program we strive to enable students to translate the information they learn into tangible skills that can make healthy eating a habit. The Wellness Roadshow is a 45-minute presentation that touches on the topics of basic nutrition, food marketing, and physical activity. Each presentation is appropriately catered to four grade levels: Prek-2nd, 3rd -5th, 6-8th, and 9th-12th. To request a presentation CLICK HERE! As an outgrowth of the Humana Grant (see below), Student Wellness Committees were created at six Jefferson Parish Schools. 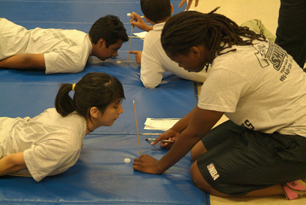 The committees comprise students, teachers, administrators, parents and community members. Using tools from the Healthy Schools Program at the Alliance for a Healthier Generation, the Wellness Committees assessed their individual schools and developed and implemented action plans to make their schools a healthier place to learn and work. To further expand the Change the Kids, Change the Future™ program, Ochsner has received generous grants from the Humana Foundation. 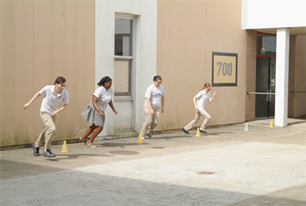 With these grants, Ochsner expanded the partnership with Jefferson Parish Public Schools by assessing the health and physical education practices in each of the 85 schools in the system and identifying best practice programs.